New Workshop Announcements Coming Soon!! Learn pouring, painting and stamping techniques that will instantly get you creating your own captivating, vibrant Alcohol Ink paintings. All supplies needed are included in the *$45.00 starter kit. Ceramic tiles and Yupo paper are included in the workshop fee so you'll leave with your own ready to display masterpieces. To register, select your class option and use the BUY NOW buttons below. If you prefer to pay by check, call Sandy at 609-268-9106 by May 1, 2015. Workshop minimum is three attendees. If workshop is cancelled, 100% of fees will be returned. For participant cancellations, the enrollment fee will credited towards future classes. Students in the morning class will explore pouring and blending to create beautiful abstract works on Yupo paper and ceramic tile. The process is quick and easy and each participant will produce several mini masterpieces, ready to display or give as gifts. The afternoon session will focus on the use of tools and techniques used to create more controlled images. 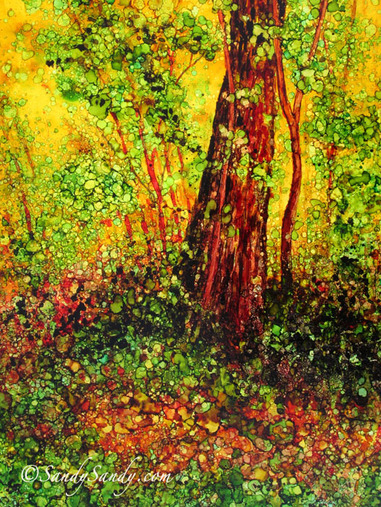 Sandy will demonstrate and guide students with tips and tricks on making larger more detailed alcohol Ink paintings, using brushes, markers, pens and much more. You can take either session or sign up for both for double the fun! Sign up today...Space is limited! must be purchased in advance unless students bring their own supplies - *see list. *Additional inks and supplies will be available at the workshop for purchase at discount prices. Give A Gift Certificate For This Class! See more details about Sandy's workshops here. Interested in a workshop or class? Send inquiries to Sandy@Sand﻿ySand﻿y.com or call 609.268.9106. 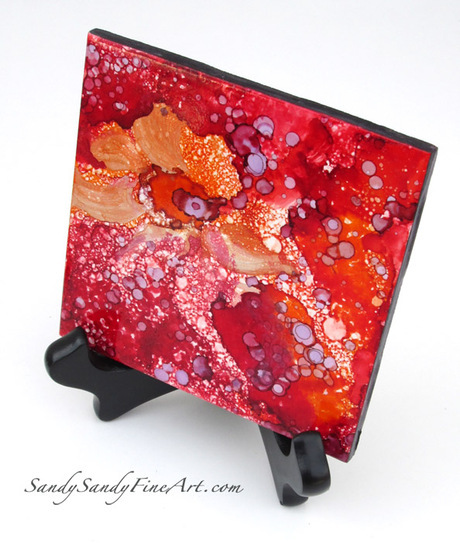 SANDY--you had 6 artists mesmerized with creating amazing alcohol ink creations at the Center for the Arts for 5 hours. This is an exciting artistic future for creative people to interpret in they own style, with skills that you share with them! ITS A ARTISTIC ADVENTURE! ~ Irvane S.
Thank you Sandy for such a wonderful day! We laughed sooooo much and learned even more. You are a wonderful artist/teacher! Please let me know when the next one is happening!!! ~ Jeannie D.